We first discovered the Kids’ Directory as an advertiser. Our family business advertised in the local Kids’ Directory in Texas for over 15 years and loved it. We tried many other advertising options and the Kids’ Directory consistently produced the best response. We believed in it and brought the Kids’ Directory concept to Charlotte. The Kids’ Directory concept is very simple: fast answers at your fingertips. The Kids’ Directory is a Resource Guide that caters to the needs and wants of the family. By making Kids’ Directory “Easy to Find & Hard to Miss”, we provide Charlotte’s parents with a publication they can reach for and use month after month. 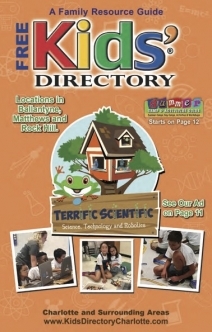 The Kids’ Directory is locally-owned and locally-published. Developed as a targeted publication for busy moms, Kids’ Directory is now published in over 100 cities. Visit www.kidsdirectory.com for a glimpse at the nationwide reach of the Kids’ Directory network. Our advertisers are committed to offering exceptional value and dependable service. When visiting or calling upon these businesses, please tell them about Kids' Directory Charlotte. They will want to know how you found them. To better serve you, please email me with any comments or suggestions, and testimonials! We’d love to hear from you!